Before I can properly test whether GFAJ-1 cells put arsenic into their DNA backbone when they're starved for phosphorus, I need to carefully characterize how phosphorus starvation affects their growth in the absence of arsenic. Yesterday I inoculated medium that had no added phosphate with cells that had been growing in medium with 1.5 mM phosphate. I'll call the no-added-phosphate medium 'P- medium', even though it likely contains a low concentration of contaminating phosphate, and I'll call the cells grown in P+ medium 'P-replete' cells. The cells doubled 3-4 times before growth stalled, reaching a density of about 2 x 10^8 cells per ml. I'll call these cells 'P-depleted' cells; I froze about 15 vials of them to use for starting future phosphate-limited cultures. Some of this growth was no doubt due to the contaminating phosphate in the -P medium, but I suspect that most of it was possible because the cells contained quite a lot of non-essential phosphate, mainly in the form of ribosomal RNA. Today I started another experiment to tease apart the effects of P in the medium and in the P-replete cells. I inoculated P- medium with P-replete or P-depleted cells, at initial densities of 10^4, 10^5, 10^6 and 10^7 cells/ml. As diagramed in the graph below, I expect the low-density cultures of P-depleted cells (dashed lines) to all grow to the same low final density, all limited by the low level of P contaminating the P- medium. I expect the high-density cultures of P-replete cells (solid lines) to all increase in density by the same factor, all limited by the relatively large amounts of P present in each P-replete cell. 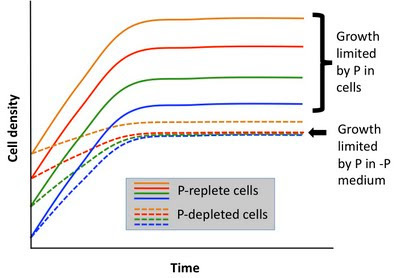 Although the graph doesn't show this, I expect the lowest density cultures of P-replete cells to reach only the same low density as the P-depleted cells. 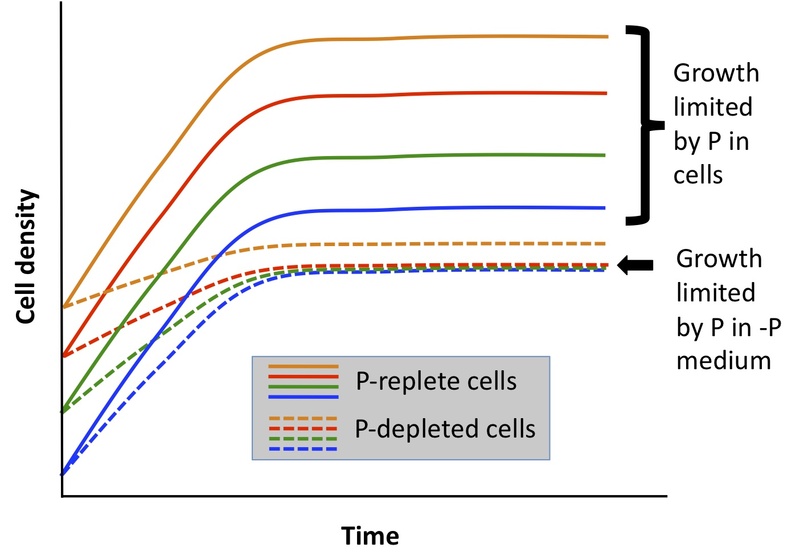 And the highest-density culture of P-depleted cells might grow to a higher density that the others, depending or how low the P contamination is and how depleted of P the cells are.